Khalife ... will showcase most sought-after aluminium systems at Decofair. The major design exhibition is being held this month (February 4 to 6) at the Riyadh International Convention and Exhibition Centre in Riyadh. 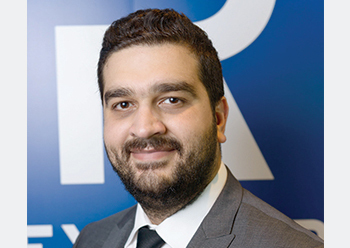 “Decofair 2019 will be the first-ever interiors design exhibition that Reynaers Middle East participates in,” said Ali Khalaf, managing director, Reynaers Middle East. Reynaers at Home was launched in 2015 to offer ‘windows and doors crafted for premium homes’ to meet the ever-growing demands of retail customers, predominately end-users choosing high-end products for their homes and villas in Saudi Arabia. And although Reynaers Middle East continues to serve customers through select fabricators throughout the region, Reynaers at Home now also exclusively provides a one-stop shop – from the design to installation stage – for Saudi home owners planning to install aluminium doors and windows in their homes, said Khalaf. He said home and villa owners are becoming more and more technically savvy as regards the performance and specifications of various aluminium systems. “The customer is well informed and, in most cases, understands the significance of choosing high-quality systems, which prove efficient in the long run when it comes to cost effectiveness and energy savings, repair and maintenance and the overall benefits of installing superior quality products in their homes,” he said. Khalaf further added that while the role of the company’s engineers is to further guide the customer to choose products that best fit their budgets, however, in the end, comfort, safety and sustainability factors are well considered for all proposals. About curtain-walls, he said these are proving to be an appreciated feature in most homes where the demand to bring natural daylight into the interiors has increased significantly. “Our CW 50 curtain-wall series serves this requirement very well while adhering to all performance specifications including those of safety and comfort,” Khalife said. The Reynaers at Home stand at the Decofair will feature the CW 50. Among sliding systems, Reynaers’ CP 130 series has been well received by villa owners, looking to extend their interiors. “We, therefore, will be promoting the CP 130 Concept Patio, a highly insulated slide and lift-slide system that meets the highest requirements with regard to insulation, stability and safety,” said Khalife, adding the system links up perfectly with the CS 77 series of window systems which will also be on display. Further elaborating on the CP 130, Khalife said the system, available with various opening possibilities, is offered with a low threshold that facilitates access into buildings. A special corner solution makes it possible to open up spaces without any fixed corner element, creating a continuity between the indoor and outdoor spaces. “This makes CP 130 ideal for rooms with a view,” he pointed out. He added that the robust CP 130 system allows the construction of large and stable sliding windows and doors with a vent weight up to 300 kg. “It also offers an aesthetic slimline middle section. The CP 130 can comply with Class 2 burglar resistance standards, offering a safe and secure solution,” he said. In addition to these systems, MasterLine 8 will make its debut at a retail-specific event at Decofair, where Reynaers at Home hopes to draw the attention of end-users to this series. Several villa projects have been executed under the Reynaers at Home brand, including the Blehed private compound, and Al Jomaih, Al Jaber and Abdulla Muallem villas in Saudi Arabia. Reynaers at Home is the Bahrain-based regional retail unit of Reynaers Middle East, the Middle Eastern subsidiary of Reynaers Aluminium, a leading European specialist that manufactures and markets innovative and sustainable aluminium solutions for windows, doors, curtain-walls, sliding systems, sun-screening and conservatories. Apart from a wide range of standard solutions, the company also develops tailor-made solutions for all market sectors – from residential to commercial and industrial projects. Reynaers’ high-quality systems meet the most stringent demands in terms of comfort, security, architectural design, and energy-efficiency. It acts as a valuable partner for architects, fabricators, solar installers, project developers, investors and end-users. Reynaers at Home will be present at Stand D-10 at Decofair 2019.